Members of the Shioya Soybeans Club and six kilograms of harvested soybeans on July 24 at Ogimi Village Shioya Community Hall. The Shioya Soybeans Club, which is working to restore indigenous Okinawan soybeans such as oohigu and takaanda, held a meeting at the Shioya Community Hall on July 24. The club reported that crop yields reached a record high of six kilograms this season. They will replant beans in October and further increase their stock of seeds. They plan to cook gojiru, which is made of crushed beans with soup stock or miso, and serve it to users of day services. In Shioya, people had a history of cultivating soybeans in terraced fields in the bay until 1960. However, the import of foreign soybeans and the migration of people to urban areas led to a fall in production and the seeds died out. 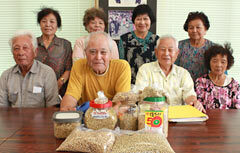 In December 2009, nine residents of the district formed a group to use deserted arable land and restore indigenous seeds. They received about 500 grams of seeds from the Naha City Hantagawa Residents’ Association, which had long been working to restore indigenous seeds. Each of the members have been growing seeds and trying to increase their number. They plant twice, in February and October. Damage from typhoons and insects prevented seeds from bearing fruit, so the harvested beans have not yet been enough to eat. The next planting is in October. If there is a good harvest, they plan to make tofu out of the garden-fresh soybeans.